We have a variety of unique sandwiches in Porto, here are some of the Best Sandwiches in Porto. A visit to our beloved city is never complete without tasting one of its most iconic dishes, the king of sandwiches, the belly-busting francesinha. Before getting to our top 5 francesinhas in Porto, let us introduce you a little bit with this Porto’s legendary dish. Francesinha means little French woman or simply frenchie in Portuguese. You may ask why the most iconic sandwich in our city is named after another country and we would have to say, good question. Though, I admit, it isn’t something we think about too much. Nevertheless, here is your history lesson: this dish was created by Portuguese emigrants to France, they encountered the french snack, the croque monsieur, and decided to take it to a whole new level, making it bigger, better and generally more delicious! Usually, a francesinha is made with bread (the thicker the better), wet-cured ham, linguiça (a portuguese sausage), steak or roast beef, everything covered with melted cheese and a special tomato and beer sauce. Most times it’s served with a fried egg on top and french fries that you can dip in the sauce. Some places like to innovate by adding an extra ingredient, but what really makes the difference in the francesinha universe is the sauce. That said, in order to find your perfect match, patience and persistence, along with a pair of sweatpants is needed to undertake this food challenge. In order to help your search along, we took to the streets of Porto and tasted a lot of francesinhas so that you don’t have to – you are welcome! As with most food items in Porto, it is difficult to select just one as the best francesinha in the city, which is why we give you the top 5 francesinhas in Porto that will definitely satisfy the pickiest of palates. O Golfinho restaurant is located in Porto’s downtown. You’ll find a narrow, but relatively long corridor-like room with tables to the left and a balcony stretching along the whole room on the right-hand side. It’s a place that really breathes Porto’s authenticity and the perfect spot to enjoy a great francesinha with your friends in a very friendly atmosphere. If you want fancy, go elsewhere. This spot is as local and original as it gets in our city. 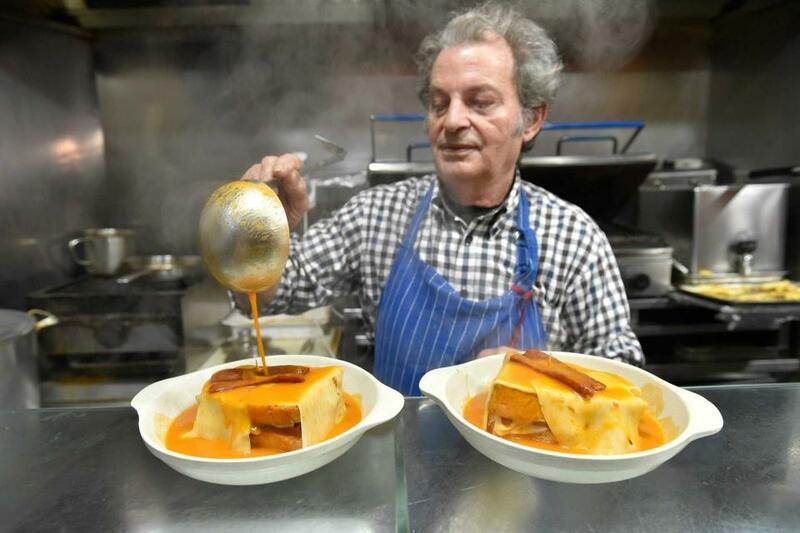 Santiago f is a family business that has become one of the most famous places for francesinha in Porto. If you walk by you will probably find a long line of people waiting! Don’t be concerned, just take your place next to the locals and wait your turn, and fear not, the line moves quickly. As with most restaurants specializing in francesinhas, the secret is in the sauce. Maybe this is where you’ll find your favorite one. Also located in Porto’s downtown, right in front of the Coliseum, Lado B (B Side) is a restaurant of modern architecture with the music to match its decor. Here you can enjoy one of the best francesinhas in Porto. You see, Lado B’s main goal, since its beginning, has been to promote the francesinha as an identity and cultural element of the city, and we believe they have achieved it. They even claim they have the best francesinha in the world so, you must go and find out if it is true! You might also be interested in the 5 Port Wine Cellars You Can’t Miss in Porto! Bufete fase, like many restaurants in Porto, is also a family business. Everything is prepared on the same day, and every ingredient here is fresh, a process that has granted them several awards. Here you will find a smoother sauce – most sauces can be a bit heavy due to the beer and spices. This sauce is a fit for everyone, including children and those with more sensitive palates. Somewhat hidden in Porto, O Afonso is a unique restaurant that stands out from the other suggestions, mainly due to a particularity. When you arrive, you will immediately be surprised by its window where a small “sanctuary” dedicated to the famous F1 pilot, Ayrton Senna, is placed. The inside is almost a mini museum, or some say tribute, to this legendary Formula 1 driver. There are F1 car replicas, photos, and even replicas of Ayrton Senna himself! A dinner at O Afonso is almost a themed dinner. 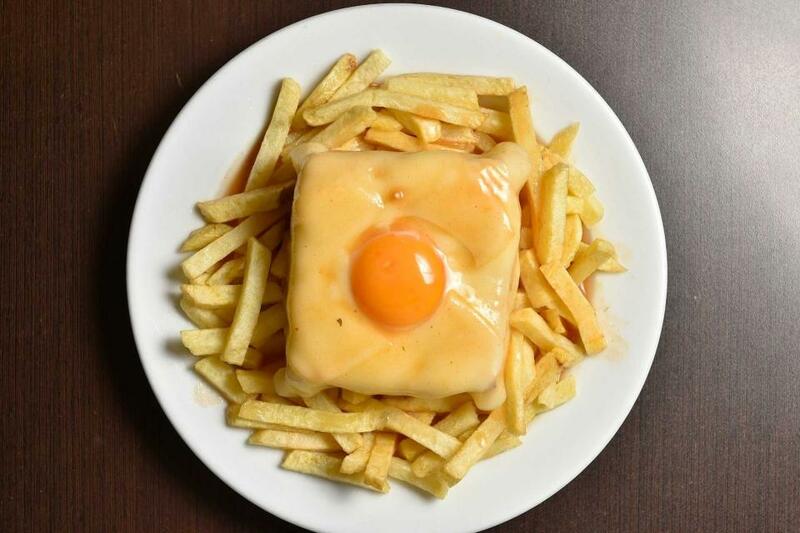 To many, this is the best francesinha in town, but then again, it all depends on who you are! There you have it, our top 5 francesinhas in Porto. If you are planning on visiting Porto, now you know where you can taste some of the best francesinhas in town, and most of all, where to enjoy a truly authentic experience and mingle with the locals. After you have tried the cities signature dish francesinha, ready to discover and taste other lesser known local traditional dishes & wines while in Porto? You might think of joining our Downtown Food Tour. Guided by our passionate local host, you will experience the Porto that tourists rarely see, taste important elements of our cuisine and hear about the history, architecture and culture while walking the streets of our beloved city.